The German expressionist horror classic still manages to inspire a bit of fright through Max Schreck's iconic "Count Orlok". 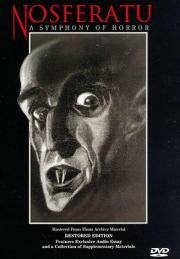 However while most of the scenes with "Nosferatu" are still creepy today, the story never managed to interest me. Although honestly, I'm not really a big "Dracula" fan either, and you know, come to think about it, I'm not really sure I even like vampires that much, and ummm...yeah, point is, all that aside, the influence of this film can still be seen throughout the genre. Combined with how it's made, sometimes the way an old movie looks helps immersion. I can't quite explain it but it feels like, to some degree, I was watching something that actually happened , like vampires are real. Anyway, obviously a classic, amazing set design. Schreck gives an otherworldly performance and steals the show. Normally old horror movies don't creep me out that much but there are scenes here that legitimately scared me. Some scenes are kind of laughable, though. I have no doubt that in 1922, this was one of the scariest movies out there. The Count is still pretty creepy 100 years later, but the horror is pretty tame compared to modern movies. Impressive camerawork for the era. Unfortunately, my version had pretty poor Slavic melodies that didn't quite fit the film ("From the New World"?). Surprised they included Van Helsing when he wasn't a major part of the plot. Some pretty great sequences and images that you're probably better off watching on Youtube. The pace is narcoleptic, and it contains some pretty egregious padding (someone please explain to me why Knock is in more than one scene). The version I watched held most of the intertitles so long that I was able to read them more than three times, and I'm a slow reader. It’s very impressive how this film can stand the test of time; the story still feels fresh and horrifying. The filming style is so influential that you still can see it today and the locations and designs are very iconic, there is not many things bad to say about it, maybe the colored black and white is distracting but then you get used to it.